Mitt Romney will charge in a speech today, according to excerpts released in advance, that Donald Trump's "promises are as worthless as a degree from Trump University." Romney's attack follows Marco Rubio's recent hits on Trump's unlicensed for-profit business "school"; at the last GOP debate, Rubio charged, "There are people that borrowed $36,000 to go to Trump University, and they're suing him now. And you know what they got? They got to take a picture with a cardboard cutout of Donald Trump." But it is a testament to the long-standing political influence of the for-profit college industry that both Rubio and Romney in fact have their own extensive ties to predatory for-profit schools. In fact, Romney has been an investor in some of the companies that own these schools. The unaccredited Trump University took an estimated $40 million from some 7000 students, and some of them are now suing Trump for fraud in two California class action lawsuits that are pending, along with a separate case being pursued by New York's attorney general. But both Romney and Rubio are tied to for-profit colleges that fleeced not just many U.S. students, leaving them with substandard educations and overwhelming debt, but also ripped off U.S. taxpayers, who foot the bill for student Pell grants and defaulted student loans. For-profit colleges are desperate to keep up friendships with Washington politicians, because they have been getting as much as 90 percent of their revenue, and as much as $32 billion a year, from federal student aid. The for-profit college industry has been badly wounded in recent years by revelations of deceptive practices, and enrollments and share prices of plummeted. But industry lobbyists remain determined to halt new regulations and enforcement efforts pursued under the Obama administration to try to channel federal money away from poorly performing, predatory schools. With Hillary Clinton attacking such predatory colleges on the campaign trail, industry executives have incentive to again provide big campaign dollars in hopes of having a friend in the White House come 2017 so that they can stay with their business model: deceiving and abusing students, and cashing their federal checks. Marco Rubio has been eager to respond. In summer 2014, Rubio wrote to the Department of Education on behalf of one of the worst for-profit colleges, Corinthian. In a letter to the Department's Deputy Secretary and Under Secretary, Rubio stated that the Department had "recently placed extreme financial constraints on Corinthian Colleges, Inc. by restricting the company's timely access to federal financial aid." He called on the Department to "demonstrate leniency" to Corinthian. Corinthian has since shut down, as its extensive frauds and abuses have been exposed, and many Corinthian students are demanding that their loans be cancelled. Potentially as many as 350,000 students could be considered victims of the Corinthian fraud, with claims rising into the billions. But in going to bat for Corinthian, Rubio appeared to see not a greedy company but a generous one. Between 2010 and 2015, Rubio's political operations received $27,600 in contributions from Corinthian. Now Corinthian is dead. But Rubio, whose home state of Florida has long been a center for for-profit college abuses and political power, seems to have been undeterred: In a speech last summer, he pledged to "bust" the higher education "cartel" -- "by establishing a new accreditation process that welcomes low-cost, innovative providers." Observers suggested, with good cause, that "low-cost, innovative providers" "could be a euphemism for for-profit colleges. However, Rubio's paid friendship with for-profit colleges doesn't come close to that of today's Trump University critic, Mitt Romney. As the 2012 GOP nomination contest neared the critical Iowa caucuses, Romney was asked by the Ames Tribune's editorial board what he planned to do about higher education. Romney's response was crystal-clear: He liked for-profit colleges, including the University of Phoenix, and especially a Florida school called Full Sail University, which, he said, knew how to "hold down the cost of their education." In fact, Full Sail only knew how to hold down the cost of education for its owners; for students, it was the third most expensive college in America. It also turned out that Full Sail's owners, the principals of a private equity firm called TA Associates, were among Romney's top donors. The Romney Super PAC Restore Our Future received $329,900 from TA executives Kevin Landry and P. Andrews McLane, and another $135,000 from Bill Heavener, the CEO of Full Sail University. Landry also donated $89,900 to American Crossroads, the pro-Romney Super PAC founded by Karl Rove. In praising Full Sail, Romney never mentioned that TA executives had contributed heavily to his campaign effort. Nor did he disclose that he was actually in business with them. The facts are these: Mitt Romney's son Tagg and 2012 campaign finance director Spencer Zwick had launched the private equity fund Solamere Capital in 2008 with a $10 million investment from Mitt Romney. In June 2012, the Romney campaign held a retreat in Park City, Utah, for about 200 wealthy donors. Remarkably, right outside the retreat, Solamere Capital held its own investor lunch meeting. In March 2013, following his defeat in the presidential election, Romney took on a more formal role at Solamere, becoming chairman of the executive committee. Solamere describes itself as a "fund of funds" that allows its privileged investors to buy into high-end private equity firms. TA Associates is one of the firms that Solamere Capital has offered to its clients for investment, according to a prospectus sent to potential investors and obtained by the Boston Globe in 2011. Another for-profit college owned by TA Associates is Vatterott College, acquired in 2009. In 2014, a Missouri appeals court upheld a jury verdict against Vatterott for deceiving a single mom, Jennifer Kerr. A jury in Jackson County, MO, had awarded Kerr $27,676 in actual damages and $13 million in punitive damages; the trial judge cut the punitive award to about $2 million because state law caps these awards. Kerr, from Lee's Summit, Missouri, saw Vatterott's TV ads and visited the campus in 2009 to pursue her dream of becoming a nurse. A Vatterott recruiter told Kerr that the school didn't have a nursing program, but it did offer a medical assistant's degree. With that credential, the recruiter said, Kerr could make $15 to $17 an hour, and her Vatterott credits would transfer to a nursing program and put her on the "fast track" to being a nurse. But after signing for more than $27,000 in loans and being in the program for over a year, Kerr discovered that her program wasn't a medical assistant program at all -- it was a medical office assistant program. You might not need college for that. Vatterott staff then told her that a medical assistant's degree would require more classes and another $10,000. The 2010-2012 comprehensive investigation of the for-profit college industry by then-Senator Tom Harkin (D-IA) obtained internal training documents from Vatterott that seemed to instruct recruiters to use exploitative tactics: "We deal with people that live in the moment and for the moment. Their decision to start, stay in school or quit school is based more on emotion than logic. Pain is the greater motivator in the short term." Another Vatterott document described the target market for recruiters: "We serve the UN-DER world, Unemployed, Underpaid, Unsatisfied, Unskilled, Unprepared, Unsupported, Unmotivated, Unhappy, Underserved!" After Michael Brown was shot to death by a police officer in Ferguson, Missouri, it was often reported that the young man was on the verge of attending college. Less well known was the name and type of school that had signed him up and was ready to cash his federal financial aid checks: It was for-profit Vatterott. Vatterott's recruiting abuses have led to bad outcomes for enrolled students. The percentage of Vatterott students who default on their student loans within three years of dropping out or graduating has been a very-high 26.6 percent. In 2012, eight of Vatterott's 39 programs failed all three initial tests of the Obama administration's "gainful employment" rule, which established bare minimum standards to penalize schools that consistently leave their students with insurmountable debt. Student bulletin boards are full of complaints about the quality of a Vatterott education. 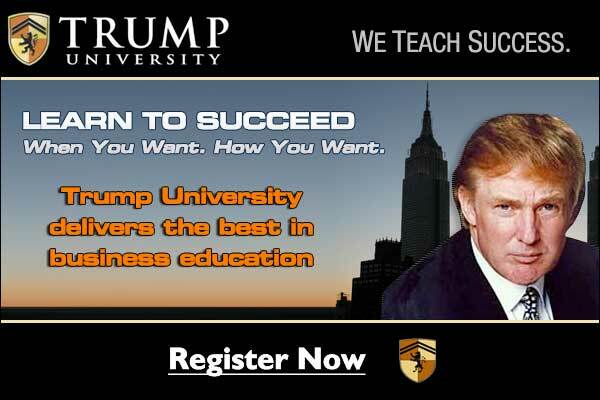 Trump University is as tawdry as the shameless huckster whose name it bears. But as critics of that sham school, Romney and Rubio are tied to even bigger for-profit college abuses of students and taxpayers.